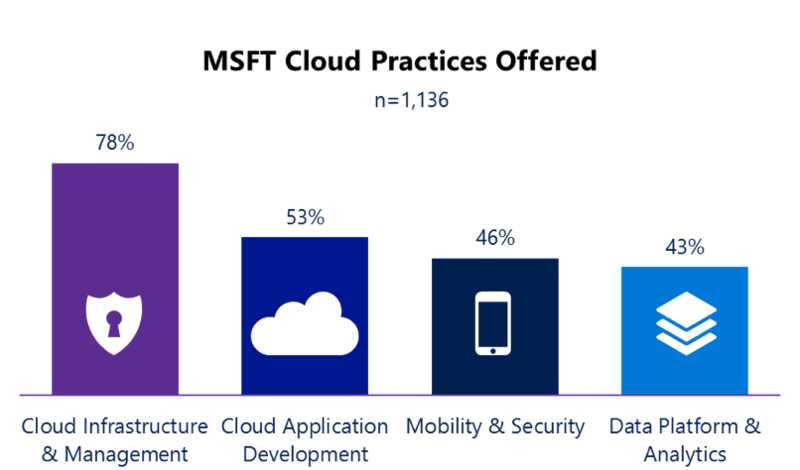 As part of our new series of Cloud Practice Development Playbooks, I’m excited to share more insights and research related to the cloud application development opportunity. Specifically, I’m eager to share how partners can build the next generation of intelligent apps with an open, comprehensive solution for any developer and any platform. 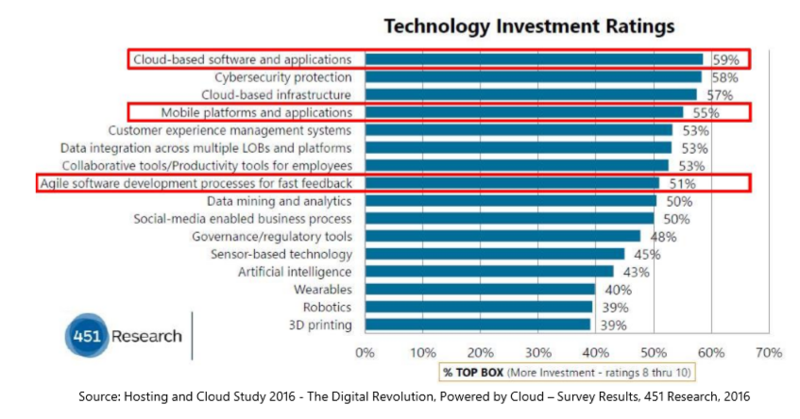 Additionally, the greatest (59%) percentage of large, midsize, and small business decision makers predict that cloud-based software and applications will be their most significant investment over the next 5 years to reach business goals. To help you fully understand the opportunity, our new partner resource, the Cloud Application Development Playbook provides research and guidance on how to help customers digitally transform. The playbook will guide you through application development, developer operations, and the endless opportunities in digital media. The opportunity for DevOps is profound. In looking at a recent survey conducted, Cloud Application and Development represented 53% of the practice area for partners in which 33% have been established in less than 2 years. To deliver a long term profitable business, automation and orchestration are extremely important functions to a successful Azure practice. Your ability to automate routine tasks allows you to lower your delivery costs and offer superior SLAs – driving a virtuous cycle of efficiency and repeat business. Automation is the key to creating the right balance between cost, reliability, speed, and time to market. Automation can also offer significant benefits to the customer as it can optimize Azure spending and increase reliability for workloads that have varying resource requirements. By enabling automation in your business, you can increase efficiency and lower costs which result in greater profitability. The top Microsoft Azure services leveraged across cloud application development projects include SQL Database, Web Apps, Azure Active Directory, API Apps, and Mobile Apps. In assessing customer challenges, DevOps can provide automation support to deliver a configuration management system, mitigate automation costs and provide a unified management plan with industry-specific workflows. While analyzing the skills and experience of the staff needed to deliver a successful cloud application development practice, we found that experienced employees contribute greatly to the overall success of our partners. 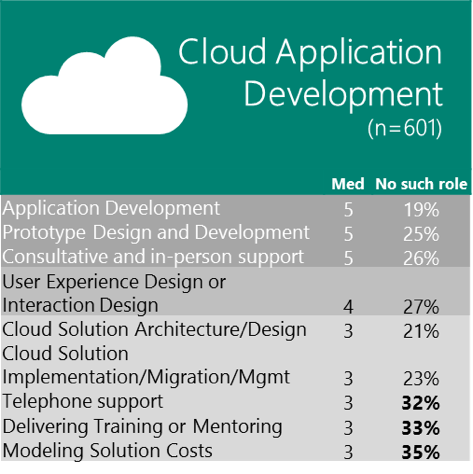 Businesses that successfully deliver cloud application development services employ people with an average of five years’ experience. We recommend that you continue to invest in your technical staff expertise by taking advantage of our growing list of Azure-focused training and Massively Open Online Courses (MOOCs). Microsoft’s commitment to partners is clear from the resources we provide to the balance of revenue we influence. In addition, you can look at what’s coming next from Microsoft with Microsoft’s Cloud platform roadmap. Partners and their customers can get a sense of the new technologies that are on the horizon, and prepare themselves to launch innovative efforts along with new capabilities from the Microsoft Cloud. To further support partners, our new Cloud Application Development Playbook gives partners the essential blueprints and tools to develop, analyze, manage, and secure an effective cloud practice that’s built to last. I hope you find this new playbook helpful in developing a profitable, sustainable, and optimized cloud application development practice. Please feel free to reach out with your questions and feedback in the comments below! How have you taken advantage of the cloud opportunity with your cloud application development practice? Share your thoughts in the comments below.